FAYETTEVILLE, Ark. 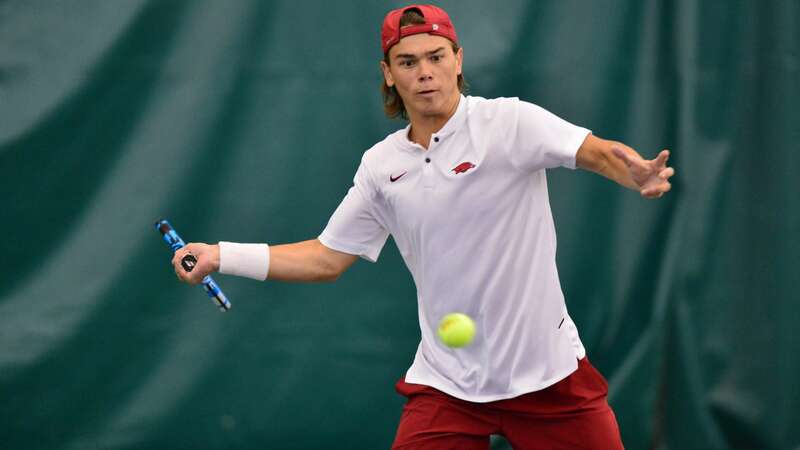 – Four days removed from beating the Auburn Tigers 4-3 at home on senior day, the Arkansas men’s tennis team will face the Tigers once again on the first day of the SEC Men’s Tennis Tournament Wednesday in Gainesville, Fla. First serve is set for 2 p.m. CT. The winner of Wednesday’s match will face Georgia at 5 p.m. CT on Friday. The 2019 Southeastern Conference Men’s Tournament is hosted by the University of Florida. Oscar Mesquida remains ranked in the Oracle/ITA Division I Men’s Rankings, coming in at No. 66 in this week’s top-125 National Singles. Mesquida defeated Auburn’s Tad Maclean 6-4, 6-1 in straight-sets in last Saturday’s match. Auburn is led by Brandon Laubser and Tad Maclean in doubles, as the pair is ranked No. 48 in this week’s rankings. Laubser and Maclean defeated Oscar Mesquida and Adam Sanjurjo in last Saturday’s match en route to the Tiger’s taking the doubles point in the match. Despite losing the doubles point, Arkansas rallied and took four-consecutive courts against the Tigers to clinch last Saturday’s match. Auburn would take the final two courts for a 4-3 final in Fayetteville.